The Church of St Andrew was dedicated in 1224 but most of the existing structure dates back to the 14th and early-15th century. 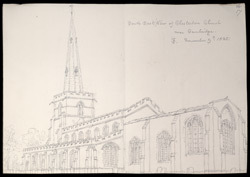 When Buckler made this drawing, the church interior was in quite a dilapidated state. Renovation on the building began in the 1840s and carried on until the end of that century.